Hello! My name is Lota, I come from Croatia and I'm 10 months old. I was born on November 29th, 2011, but my story actually began on a day when I collapsed on my daddy's arms during an afternoon walk. I was 5 months old. Mom and dad rushed me to a hospital where I had my blood sugar level checked. It measured at 1.9 mmol/l. I received a bolus of 10% glucose and 2 hours later my blood sugar level was once again 1.9 mmol/l. My parents were told I needed to stay in the hospital. My mom wouldn't leave me alone so she stayed with me. I got continuous glucose infusion and had my blood drawn several times a day for some laboratory investigations. Days passed by and my parents weren't being told anything. My mom kept asking how serious my condition was and if I was in any danger but she received no concrete answer. One week later doctors came up with a diagnosis – congenital hyperinsulinism! My parents were explained it was a very rare genetic disease with several possible forms and that determining a suitable treatment would be a long-term process that would require patience. The glucose infusion I had received turned me overnight into a joyful and cheerful baby – for the first 5 months of my life I cried all the time, constantly asking to be carried by my mother or my father but I ate often and a lot and was well developed. Therefore my pediatrician said everything was all right and that I was simply a demanding baby. What a surprise for my parents and family! We were transferred to the Pediatric Endocrinology Department of a specialised hospital for further evaluation and treatment. The first step was to try a treatment with diazoxide. Since I was 5 months old, doctors decided I was old enough to eat with a spoon. In that manner I was supposed to receive medicine 3 times a day and maltodextrin in every meal. However, until then I had never been fed in any other way than on my mother's breast and accepting a bottle or a spoon was something I wouldn't think of. I struggled with nurses who were trying to feed me for two whole weeks. Every day my resistance towards their efforts grew bigger and my will to defy them stronger. After two weeks I didn't want to open my mouth to anything anymore, not even to my mother's breast. Since I received neither medication nor food in that manner, I finally got the feeding tube. Since there was no positive reaction to the medicine, doctors gradually increased my dosage of diazoxide. Weeks passed by without any apparent improvement. That period was extremely difficult for my parents. My mom didn't leave my bedside at all and my dad worked night shifts only in order to be with us in the hospital during day time. I had my blood drawn often for the purpose of laboratory investigations and my blood sugar levels were measured regularly. All that time I was receiving continuous glucose infusion. Glucose made my veins fragile and inserting a venous access grew harder and harder. I had my feeding tube changed every 4 days. When diazoxide had reached high levels, it became hard for me to endure it. For two weeks I suffered from an evergrowing nausea until at the end I wasn't able to keep anything inside anymore and vomited constantly. I was tormented and worn-out. At that point my mom and I had been in the hospital for almost two months. My mom couldn't stand everything I was going through and she cried a lot. Dad carried us both through that period on his back, so to speak. My mother's sister-in law and my godmother at the same time was heartbroken because of me and she decided she wasn’t my godmother in vain and that she had to do something. So she began to browse the Internet and found stories of other parents who had children with CHI. They all spoke of an excellent team of specialised experts in Germany and a surgeon who successfully operated on them, so she decided to write a letter to that surgeon and ask for help. And the good doctor replied. It was Prof. Barthlen. My mom continued to correspond with him. He patiently answered to all of her questions with much understanding, kindness and sympathy, putting himself at disposal at any time for further assistance. He explained that in case of a diffuse form they did not perform 95-98% pancreatectomy like it is done in the rest of the world. Instead the resection of pancreas was as minimal as necessary in order to try to avoid the onset of diabetes later on in life. Since my parents had no idea what form of CHI I had, it meant a lot to them. The fact that there was a chance of surgery being performed laparoscopically also sounded encouraging. Since diazoxide treatment wasn't successful, doctors decided to change my therapy. So I began to receive sandostatine injections 4 times a day - one every 6 hours. Even with a small quantity of medicine the progress was evident – blood sugar levels stabilized and I wasn't falling into hypoglycemia anymore. Several days later glucose infusion was taken off. After more than two months I finally wasn't bound to bed! Mom and dad learned everything they needed to know to take me home and for the next two months we managed on our own. Genetic analysis showed there was a chance for me to have a focal form of CHI so PET-CT was to be made. A PET-CT scan appointment was then arranged with Prof. Wolfgang Mohnike in Berlin. My parents were looking forward to it because giving me 4 injections a day was becoming more and more difficult for them. The more I grew, the harder I fought. Finally the day came. PET-CT showed focal disease on pancreas tail! Those were the best possible news! Surgery was already scheduled for a few days later in Greifswald. 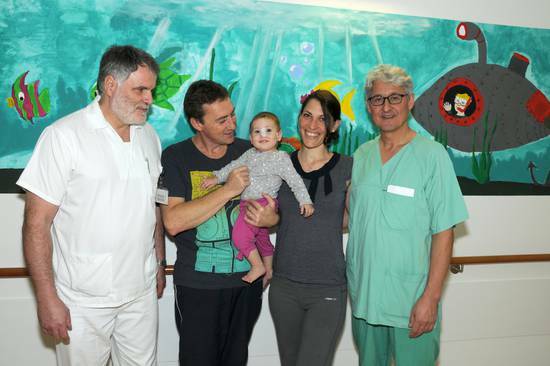 Greifswald welcomed us kindly and in a very professional way – in that big beautiful hospital we got a large room where we could all be together – my mum, dad and me. I joyfully gazed at big colourful drawings covering the walls. We even got the stroller so we could go out for a walk more comfortably! Prof. Barthlen performed a laparoscopic surgery on 24.9.2012. It passed without complications, the focal lesion was removed and my blood sugar levels have been normal ever since! The few days after the surgery were hard for my parents but they felt revived by the fact that I had become a completely HEALTHY baby! The nurses and Prof. Barthlen's team made those days easier for them making sure they had everything they needed. Prof. Barthlen visited me several times a day. Everybody wanted to make sure I was feeling ok.
As soon as we could go out again, we spent time walking around Greifswald and we went to see the Baltic sea. In less than two weeks after the surgery we were allowed to go home! My mom said that after everything she felt like she was leaving a dear friend instead of leaving a hospital. I still have three little dots on my belly from the surgery but I am sure in time they will disappear as well. Here ends my CHI story and the feeding tube (that we are still struggling with) story continues... That chapter is yet to be written. 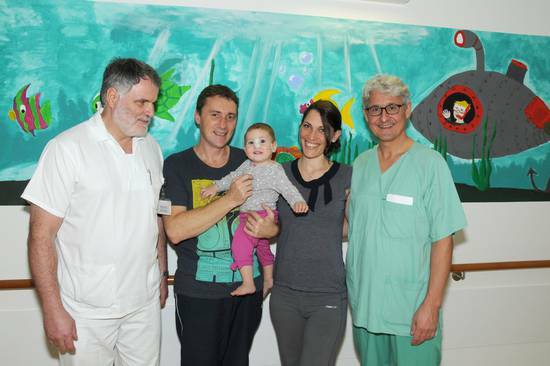 My parents and I would like to thank Prof. Barisic and her medical team for making the diagnosis quickly. Big thanks to Dr. Rojnic Putarek and her medical team and to all nurses who took care of us from my first day in the hospital. They were gentle towards me and patient with my mom who wasn't always pleasant. Big thanks to Prof. Barthlen's CHI consortium - Prof. W. Mohnike from Berlin and Prof. K. Mohnike from Magdeburg as well as to Greifswald medical team and nurses. To Prof. Barthlen himself we owe our deepest gratitude – thank you for being such a beautiful human being – kind, compassionate, loving, patient – my parents couldn't have wished for a better doctor to operate on me. Special thanks to my grandma and grandpa who were beside me for hours every day of my life for 5 difficult months and to both of my uncles for thinking of me every minute of a day. Thanks to all members of our family and all of our friends for support. And ultimately – to my beloved godmother a big, big thanks – without your enormous love we would never have met Prof. Barthlen who forever changed our lives for better.